Which Members of Congress (MoCs) should I write to? In most cases you should only write your own representatives. Your Members of Congress (MoCs) and your state and local reps care what you think. When a MoC receives correspondence from someone out of district, they usually either forward it to your own MoC or discard it. Where do I find the addresses to use? Find out who your Members of Congress are at govtrack.us/congress/member. Follow links to each of their websites and use the address card provided in the Pack or just make a list of their district or local addresses and phone numbers. Which is better - my MoCs Washington DC address or their local office? Mail sent to the capitol goes through a lengthy screening process and can be delayed up to 3 weeks. So many former staffers, recommend contacting the district offices instead. Follow your instincts. Either location will work. Can I write to any MoC if they're making laws that will affect everyone? The impact of writing to committee members who aren't your MoC will vary based on each individual recipient's correspondence policies. So although there are no guarantees, it couldn't hurt to try. If they receive a high volume of input on one bill, even if some is from out of district, the weight of public opinion will be felt. What about writing the President? My MoCs are all on the same page as I am. Should I still write to them? Even if they are fighting for what you believe in, your occassional postcards of support will add fuel to their efforts. But you can save most of your post carding energy for targets who could be persuaded to act when they otherwise wouldn't have. Who can I write about issues related to my state or my city? Lots of policies and laws that have a big impact on our lives come from state and local jurisdictions. Postcards and phone calls can be very effective at getting the attention of your state governor, your State Rep and Senator, your mayor, city councilors, county commissioners and other local representatives. Do thank you cards matter? Definitely! Being a politician is a hard job and most of what they hear is criticisms. Plus there are lots of other courageous people in the media, and everywhere who would be buoyed and encouraged by an appreciative postcard! Appreciation helps people keep things moving in a positive direction even when it's a steep uphill climb. If you're listening to the news or reading the paper and something you hear upsets you or resonates with you, that's a good topic to write about. Another way of sourcing ideas for what to write about is to subscribe to one of the many compilation lists of current legislation and the name and address of who needs to hear from us. See the Resources page for specific links and suggestions. I have so much to say. How can I ever fit it on a postcard? If you have a lot to say, you should write a lot of individual postcards with one topic per card! Covering multiple topics in one postcard may feel therapeutic, but it will most likely mean that when your card is read briefly by staffers, it will be discarded and not reported to the MoC. How can I keep up with everything we should be vigilant about? It's basically impossible to keep up with everything yourself. Remember that there are many many people watching and speaking out. So it's not all on any one of us to be vigilant about everything. Many hands make light work, so just do what you can do, when you can do it and keep yourself strong for the long haul. How can I track bills as they go through Congress? Is a general comment without a specific ask worth writing about? As long as your general comment is categorizable by the staffers who will read it as either FOR something or AGAINST something, it will be logged and is worth writing. If you have a brief personal story about how this affects you then it is definitely worth writing. How personal should my card be? 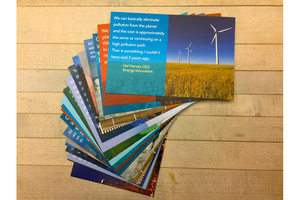 Telling a story of how an issue affects you will make your postcard have maximum impact. MoC's use stories to read aloud in their testimony, and it naturally affects their thoughts about an issue more than just a statement of opinion without any reasoning. Do I need to include my address? If you're writing your own MoC, definitely! Your return address within their district ensures they will pay attention to what you’ve written. Plus you may get a written response. When writing others, I recommend signing it in whatever way will be most relevant to them. Concerned Citizen, Business Owner, Parent, Teacher, etc. Can I use curse words? Yes, but keep in mind that staffers have a high volume of correspondence to process so they need to be able to do it quickly. If your card is not easily legible, it will be discarded. How often should I write to my MoC's? Whenever you have something important to tell them. But if you write frequently enough that you might become known as a constant correspondent, consider directing some of your interest to writing your state and local reps or other government officials. Can I write the same card more than once? Using the same wording on a card to each of your three MoCs is a great time saver. If you are referencing a particular bill, try to adjust your copy to reference the bill number relevant to the Chamber that your MoC serves in. How does the information I write get conveyed to my MoC? Staffers will quickly read each correspondence received by their office. Most MoCs use one of several approved constituent management software platforms and the staffer will categorize your comment and add it to the running tally of comments taking a similar position. If there's a story they find compelling your card may be saved out to be shown directly to the MoC. Does all this input work for my local and state representatives too? Definitely! Any elected official wants to keep their constituents happy so they can be re-elected. And since they have a smaller pool of constituents than a MoC, local and state officials will probably be even more interested in someone taking the time to contact them. Does all this really make any difference? Yes! Though any one card on its own is unlikely to matter, the aggregator of many many constituents who take the time to speak out definitely gets the attention of our elected representative. And it may leave you feeling more empowered and hopeful which is important too. Is calling better than writing? Calling is more immediate. So for issues coming up sooner than the 2+ weeks it might take for your card to be screened and logged, picking up the phone is definitely better. But written correspondence, especially when there's a compelling personal comment, or when aggregated with many other cards, is an effective way to get the attention of elected official. What can I do when I’m feeling overwhelmed? Remember there are millions of people paying attention now. So allow yourself to take a break from the news when you need to. Spend time with friends. Do things that make you happy. Staying balanced will keep you strong for the work that is ahead. What else can we do besides write postcards? Attend town hall meetings with your MoCs. Work with your neighbors on local projects. Become a sustaining monthly donor to organizations you support. Volunteer your time in your community or on a candidate's campaign. Join a local board or working group. Be the change you want to see! How can I find other people to write postcards with? Invite friends over for a postcard party. Or connect with your local chapter of Indivisible or Solidarity Sundays. Or just make a regular phone date with one friend and put each other on speaker phone while you write cards together. The Information We Collect: Collective Vision collects from you only the necessary information, such as name, email address, address and payment information, to process orders. We Do Not Share Your Personal Information: Collective Vision does not sell, trade, or rent your personal information to others. This information is for our private records only. We restrict access to your orders to those employees who need to know that information to provide products or services to you. Personal information is not available to any third party via our website or through other means. All orders are shipped via US postal service, first class or priority mail. We do not ship outside of the US. We guarantee your complete satisfaction. If you are not completely happy with your purchase we will send you a replacement set free of charge or refund your order. Some of the card packs are collated by hand by humans so occasionally there is an error. If your card pack is missing a card, let us know and we'll gladly make it up to you by including extras in your next order or sending you the missing cards. Thank you for your understanding in these situations.